In this episode of the eLife podcast we hear about using photographs to diagnose rare genetic disorders, an unexpected benefit of exercise, hybridizing fish species, the mysteries of the MECP2 gene, and the risks and benefits of using gene drives to alter wild populations. 00:34 - What's in a face? 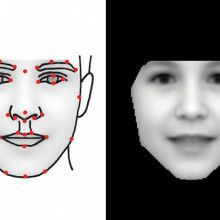 Using computer vision and machine learning to analyse photos of faces can assist in the diagnosis of rare genetic disorders. Christopher - Some rare diseases are so rare that a single clinician might not ever see them in their entire career and that their reliance has been on identifying multiple people with the same disease when there might be less than 10 people across the entire world alive at any one point. So, we tried to create a computer vision approach to teach a computer to analyse faces in photographs to try and find and cluster these patients by which disease they might have. Chris - Was this literally going up to people who have diagnoses, taking their photo and then training the computer"this is what condition X looks like", or can you be clever at them at and go to online databases where there might be many, many images of these people and build your tool that way? Christopher - So, we went online and collected publicly-available photographs of people with well-established and relatively common rare diseases that we could then collect lot of examples from. Because we have machine learning and computer vision, you're reliant on many examples to get accuracy. So, we got around about 100 to 200 images for 8 different syndromes. We use those to train the computer what to look for. Chris - And these are all disorders that manifest with changes to the way a person's face makes them look. Christopher - So, not all rare diseases will have changes in their facial structure, but in the development of the head and face, a large fraction of our genes in our genome are used. So, it's quite likely that a mutation might disrupt some part of development for the facial structure as well. So, it's been estimated that maybe 40% to 50% of rare diseases at least have some sort of manifestation in face or cranial structure. Chris - And so, - what - you would present your system with a snapshot, it would draw out these features by analysing the face and then it would compare its snapshot readings with your database of many different faces from individuals with known diagnoses and see which featured it shared most in common with those faces with those diagnoses and then return you, this is likely to be condition "X". Christopher - Yes, so it could be used in that way. But the current approach has just been a proof of principle. So, it's not sufficiently accurate at the moment to be considered a diagnostic tool. We consider it more as a way of narrowing the search space for possible diagnoses. But it does this by comparing between people it had seen before. Chris - What about the fact that you're just using 2-dimensional photographs? Could more accuracy be delivered by looking at 3-dimensional images if you were to take stereoscopic pictures of an individual and analyse that? Christopher - Absolutely and so, there has been a lot of work into analysing rare syndromes with 3-D imaging previously and they get very detailed data. But our approach tries to expand into more accessible data because everyone has access to a camera or scanner, or a digital camera. And so, it is easier and more accessible in the future to try and use normal 2-D photographs. And so, we don't have as high accuracy as for 3-D imaging, but with the machine learning we've been using, we've been approaching the discriminatorial classification accuracies of 3-D imaging for the 8 syndromes we've been using. Chris - So, how would you see this being deployed in the future? Would this be a tool that say, a hospital doctor could take a snapshot of a new born baby and feed it into your system which would remotely analyse it and then return a possible diagnosis or a list of diagnoses for individuals that clearly do have a problem but the doctor may not know what they are? Christopher - Yes. So, that's precisely how we see this being deployed in the future through normal healthcare services as an expert tool for clinicians to narrow diagnosis when a rare disease is already suspected. Viewing a visual stimulus whilst running helps mice that have lost their sight in one eye to make a near-complete recovery. Michael - A few years ago, we discovered that when mice start to run, their cortex goes into a high gain state and in which the neurons respond much better. The question we wanted to ask in this paper was, whether this enhanced response would allow more neuroplasticity. That is, would allow the animals to change the way their brain responds much faster in response to a certain kind of activity. Would they learn better? Would they recover function in their visual system if their visual system had developed abnormally? Chris - When you said they're in a high gain state, do you mean that literally, if you record from groups of nerve cells firing in the cortex, you see more firing or do you see bigger pulses, bigger amplitude? Michael - We see more firing. More of the neurons fire much more strongly about twice as much when the cortex is in this state. We think this state might be important for things like attention. 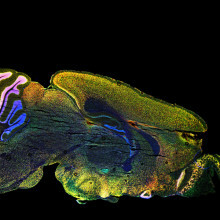 But at least in the mouse, their visual cortex goes into the state when the mouse starts to move through the world. Chris - Part of me is wondering if this is the reason why some people - I mean, it sounds a bit lame, but some people say they like revising when they go for a jog and they'll listen to some learning tape and they'll say they remember more if they go jogging. Do you think the same apply to humans? Michael - I don't know whether the same applies to humans and it's something we're tremendously interested and we're beginning to study now. Several of my colleagues tell me that they like to read papers on the treadmill because they remember them much better and understand them much more quickly. Chris - I'm calling to mind the memories of medical school lecturers pacing up and down at the front of their lecture. You never see a lecturer stand still and as they're highly polished or a comedian stay in one place on a stage. they always walk around and one wonders whether this is playing out in the same way as your mice do. Michael - I suspect that maybe because I feel the same thing when I lecture. I would much rather walk back and forth than point at various things and be physically active rather than to stand there like a statue. Chris - So, what did you do with the mice because obviously, you can't get mice to give a lecture? Michael - What we did with the mice was to feed them like children who were born with a congenital cataract in one eye that obscured the vision in one eye. And so, we took mice and closed one of their eyes for a period of several months and humans who grew up with a problem like this later, when the optical problem is corrected completely, later these people have lost the ability to see in that eye and are dramatically impaired when they try to look at the world through that eye. They're functionally and legally blind. Chris - So, is this because something in their brain has changed which means their brain is essentially ignoring the visual input from that eye which it previously would've paid attention to? Michael - Yes, most of the connections from that eye to the visual cortex are lost during a critical period in early life under these conditions. And so, the reason that people find it difficult to see is that their eye is not connecting properly to the brain anymore. The goal of our experiments in mice was to see whether these enhanced neuronal responses we see in the visual cortex during locomotion would allow them to recover much more vision and much stronger visual responses to the deprived eye. Chris - And is that what you find so you get the mice doing more activity and compare them with mice to do less activity? Do you see that they'd get more functional recovery in the previously close eye? Michael - They get dramatically more functional recovery. So that mice that get no special stimulation and stay in their home cage never recover more than halfway to normal whereas the mice that are allowed to run while they're getting high contrast visual stimulation, their vision recovers to near normal levels quite quickly within a week. Chris - There's a central sort of tenet in your science which head put forward, which is that things that fire together, wire together. So, do you think that you've got every simple situation where you've just go enhanced firing because of the locomotion, the exercise, you present that with a very powerful visual stimulus, this is going to drive cells very hard as well so you've got the same cell firing with the locomotion and with the visual stimulus and the connections there are going to reinforce? Michael - That's one of the possibilities and it's the one that I think is perhaps most likely. But another possibility is that when you'll have this exercise, you have more acetylcholine which is a chemical that affects neural transmission in neural cortex, you'll have more adrenalin. So, it's possible that some of these chemicals that are associated with these are the signals that mediate the greater plasticity. But the idea I favour is exactly the one you articulated. Chris - And obviously one very important question from a sort of neuro rehabilitation perspective, if I took someone who had had a disabling stroke robbing them of one particular brain function, would the right thing to do be to repeat the experiment you've done with the mice, but with an appropriate stimulus relevant to their injury and see if you can get therefore enhanced recovery for them. Michael - Well, that is the long term promise of this and at present, we just don't know whether that would help or not. We intend to study that, but at the present time, we really can't say whether that would be true or not..
How do different species remain distinct if they can mate with each other to produce hybrid offspring? Molly - In the past 10 years, we've begun to realise that maybe in-between different species or hybridisation is really common. That raises a little bit of a problem in understanding how species or different groups of organisms stay distinct in the face of this genetic flow between them. 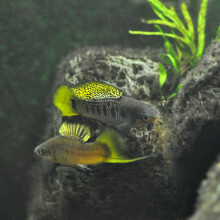 We study two species of freshwater fish, Xiphophorus birchmanni and malinche that hybridise quite often. But we don't see a lot of evidence that these species are really breaking down. And so, we wanted to understand what genetic barriers might be existing between them. Chris - Is this because Molly, when you get a hybrid that the hybrid itself then cannot continue to interbreed with members of the individual species and that stops the further evolution of that hybrid? Molly - So, in a lot of species, hybrids are inviable, are infertile, but that isn't really the case in these species which is part of the reason they're very interesting. Chris - So, perhaps the hybrids are more vulnerable to being caught by a certain predator and this keeps their numbers down. Molly - Or they're less effective at foraging or finding mates, or any of these sort of things that are important in the wild, but not apparent to us in the lab. Chris - So, how did you explore this genetically to try to find out what was going on? 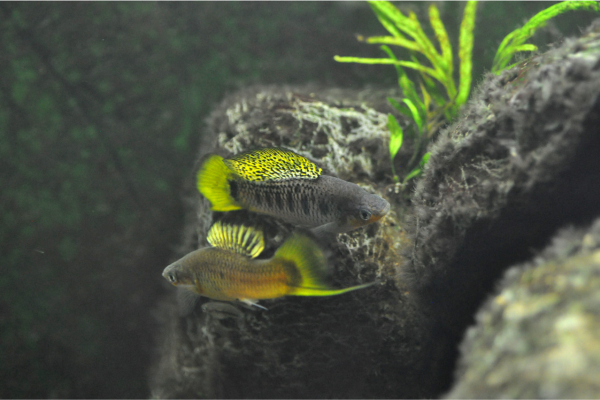 Molly - Basically, the idea behind what might be breaking down in hybrids is that you have these two genomes in the parental species that are evolving independently. They accumulate mutations and then when you reintroduce these genomes to each other in hybrids, they can interact poorly. And to give sort of a specific example of what that would look like if you have two proteins that work together in the same pathway and in the two species, they've accumulated difference and they can't work together anymore. Any hybrid that has the combination of those two proteins will be selected out of the population. So then when you go and sample hybrids from the population you'll see an absence of that combination, just sort of the footprint of selection on that population. And so, that's basically what we did is, we collected hundreds of hybrids from two populations and looked for that signature of the missing genotypes. Chris - What did you find? Were there areas of the DNA which clearly, if mix them together in a hybrid were a toxic combination? They just didn't crop up when you went looking for them. Molly - Yeah. So surprisingly, we found 207 pairs of regions that were significantly missing in both hybrid populations. This was a lot more than we expected. These two species have some clear differences in terms of their ecology. For example, malinche has adapted very cold environments and birchmanni is adapted to warm environments. So, we expected that we might see a few regions associated with ecological differences, but we did not expect to find so many. Chris - What does this tell us more generally about how hybrids are or aren't maintained in populations? Molly - So, I think the bottom line here is that when you look at hybrids in the lab, you're missing a lot of the selection that's going on. 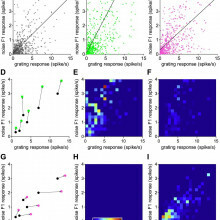 And one of the things that I didn't mention earlier is that even though we find so many pairs, when we estimate selection on these interactions, the selection is actually quite weak. So, around 2% or 3% disadvantage for that hybrid genotype. What that means is that in this particular case, many selection effects that are weak are contributing to reproductive isolation between the two species as opposed to the more classic cases where you have strong selection effects on just a few sites. Chris - Because you've said there are lots of little contributions and so, a big number times a small number still makes a fairly big number which is why you see this effect, do you think that the same sorts of genes are going to crop up in different species though or do you think that the kinds of genes that exert this fairly toxic effect, they're going to end up being species-specific? Why does too little MECP2 cause Rett syndrome? Laura - So, in our lab, we study a gene called MECP2 and it turns out that it's really important because we see that if you have too little of the gene, in humans, you see Rett syndrome which is a progressive neurological phenotype. Girls typically had this disorder and they'll develop normally for the first 6 to 18 months of life. And then you'll actually see developmental stagnation and then regression. So, they'll lose purposeful hand movement. They'll develop anxiety and other autistic features, mostly late motor deterioration. On the other hand, if you had too much MECP2 then this presents in different disorder called MECP2 duplication syndrome. What's interesting about this is that it's also a progressive neurological disorder. We see some overlap with the phenotypes such as autistic features. But it's also distinct and that we see spasticity and seizures, and infantile hypotonia which isn't seen in Rett syndrome. Chris - What exactly does this gene do? Laura - So, we know a bit about what MECP2 does. Its level increases highly throughout development and so far, what's really known is that there's two main domains. One, binds DNA and then the other represses other genes. And so, I think that these work together to regulate other genes that are expressed during development and then throughout adulthood. Chris - So, giving that important role its ability to influence many other genes, it's not surprising that it probably has an impact on the way that the brain develops and functions. But then the question is, well why does too much of it have this effect and why does too little of it have an effect? How can you disentangle the two? Laura - Exactly and that's one of the questions that we aim to address - to try to figure out what MECP2 is doing in both Rett syndrome and MECP2 duplication syndrome. We chose to study two point mutations in the gene - one, which affects the domain which binds DNA and one which affects the domain responsible for repressing genes. And so, when we look at these, when it's the only copy of MECP2, we can get an idea of how it affects the function of MECP2. On the other hand, if we express it with an extra copy of MECP2, then we can get an idea of which domains are required in order to see these toxic phenotypes. Chris - So, you can dissect apart which of the two ends of the molecule is involved in each of the two phenotypes, can't you? Chris - And go on then, spill the beans. When you do this, what do you see? Laura - So, when we do this, we see that we actually need both domains completely intact in order to see the duplication phenotypes. This is really interesting since a lot of previous hypothesis thought that maybe just the one domain was responsible and the other didn't really play a large role. Chris - So, you need both ends of the molecule to be active in order to do the job of causing the syndrome if you have the duplication problem. But what about if you've got the deletion or the initial mutation just in one copy? What about that phenotype? Laura - When in the Rett syndrome context, we also find that completely messing up one of the domains will lead to an null phenotype on a very severe actually. So, that means that whatever additional function the repression is handling, it's not enough to overcome the lack of binding to DNA. On the other hand, when we looked at the repression domain, we actually found a couple interesting things. We saw milder phenotype. So, they still had many of the same phenotypes that we're used to seeing, but not as strongly. We also found an additional function for this end of the protein. So, we initially thought that it just interacted with other proteins in order to request transcription. But it turns out that it can also bind DNA. Chris - What do you think the implication of that is? What does that actually translate into in terms of our understanding of this process? Can mosquitoes be made resistant to malaria? Kevin - One particular animal that we would love to alter in the wild is the mosquito, so they can't spread malaria. It is a terrible disease that kills 650,000 people a year, most of them children under 5. We know about particular genes that we can put in the mosquitoes that render them unable to transmit malaria effectively. The question is, how can we spread those genes through wild populations? We started by looking at some results from the laboratory of Austin Burt in Imperial College London. We ran some simulations suggesting that we might be able to spread genes through wild populations if the gene can benefit itself. Now, there are some genes in nature that can do this by biasing the odds that they will be inherited by offspring. Chris - How did they do that? Kevin - This particular class does it by cutting the competing version of the gene, such that the cell will then copy over the cheater. Austin Burt suggested that we might be able to adapt these genes to spread traits that we want to through the wild organisms. Chris - So, if we look at your malaria example then, if you had genes which are capable of suppressing malaria in a mosquito, and you confer this technology on that gene, then it's going to copy itself within the individual mosquito and then propagate through the population because it strongly selects itself. Kevin - That's exactly right because it is inherited almost twice as often as a normal gene. In fact, that single gene advantage is strong enough that it can even spread if it reduces the ability of the organism to survive and reproduce. The problem was that we didn't have the molecular scissors necessary to make the cuts. We needed really good molecular scissors that could not only cut whatever sequence we wanted but can also cut multiple sequences right next to each to reduce the odds that evolution could come up with mutations that would block the ability of the scissors to cut. Chris - So, do you mean in the same way that when we have an infection and we use antimicrobial drugs, bacteria can mutate to surmount the effect of the drug. 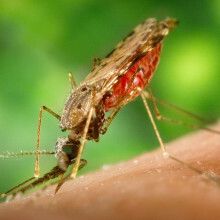 But if we give multiple drugs at once, because we're hitting different independent targets, it's much harder to mutate each of those targets independently and simultaneously to make an organism that's resistant, and you could do the same thing with a malaria mosquito with this technology? Kevin - That's exactly right. If we can target multiple sites within the original gene that we want to replace then we can make it that much harder for it to evolve resistance to our ability to copy over it. Chris - Let's just look at the nuts and bolts of this a second then. So, what this would take then is, you have to have a set of these molecular scissors which are going to cut genes. You've got to plumb that into the genome in the correct genetic place - or locus - which you want it to target so it then copies itself with the ability to delete any opposing gene and then copy itself in there, but you're going to have to do that not just in one, but multiple places in the genome, can we do that? Kevin - We can. Over the last couple of years, we've been developing a technology called CRISPR that is essentially molecular scissors that can target almost any sequence in the genome, even multiple sequences in the genome. We've used it to-date to edit the genomes of a wide variety of organisms because it seems to work in just about everything. The way we do it is we introduce the CRISPR system into the cell we want to edit along with an altered version of the gene. So, the CRISPR system cuts the original version and the cell repairs the damage by copying the altered version. So, our idea was, how about we simply encode the CRISPR system right next to the altered gene such that when the cell repairs the damage to the original gene, it will copy both the altered gene and the CRISPR system. That way, the offspring of that organism will inherit the altered gene and the CRISPR system. And they'll also inherit from the other parent a copy of the wild type gene, the original version. CRISPR will then have again to cut the original gene and copy over the altered gene and the Crispr system. This way, the Crispr system effectively makes that same edit in every generation even in potentially the wild. Chris - Based on your own modelling studies, how quickly could that propagate through a population because that will be an absolutely critical thing if this is to be an effective control against malaria? Kevin - So, it depends on how many altered organisms we release, relative to the size of the original population and also, on how fast the organism reproduces. Insects like mosquitoes that breed very, very rapidly, we could potentially alter all of them in a span of only a few years. Chris - What about the environmental consequences, negative impacts, and also, the rebound of the strong selective you're going to put on the pathogen? Will it not come back with a vengeance with some strategy to surmount your CRISPR system? It could evolve an anti-CRISPR gene for example.